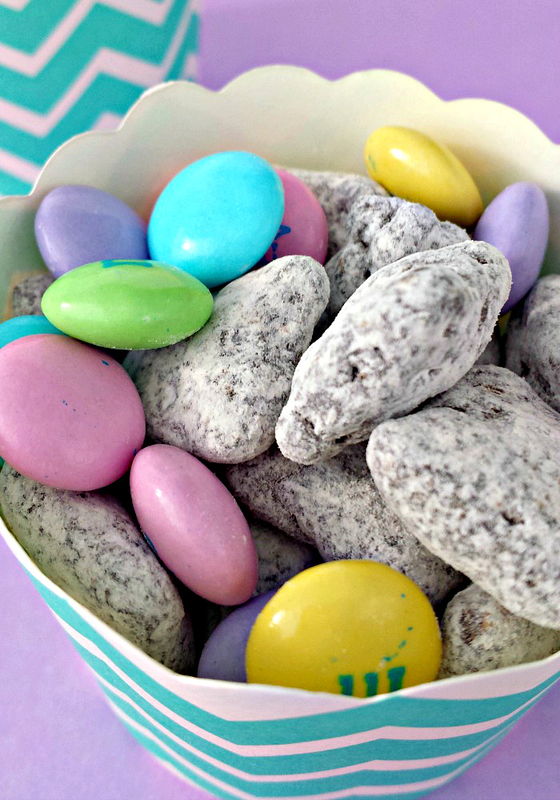 Serve up these Easter Muddy Buddies, and watch them disappear! They’re easy, colorful, and only take about 20 minutes to make! We all need a few easy-peasy holidays recipes in our repertoire, and my Easter Muddies Buddies are one you’ll want to save and make over and over. This is a fun twist on a classic muddy buddy recipe, and it’s easy enough that the kids can help! I can’t believe that Easter is only a few weeks away, but I’m not mad about it. I love Easter for so many reasons. It usually means Spring is here, Easter eggs hunts, family traditions, and the FOOD. Cooking starts in the morning. The kids will need energy for all those Easter egg hunts, and I always make a big batch of muddy buddies to munch on throughout the day. Muddy buddies or “puppy chow” is simply Chex cereal coated with chocolate, peanut butter, and powdered sugar. You can keep simple as we did here or add whatever you want. Mini marshmallows can be used as “bunny tails”, pastel-colored nonpareils, Jordan almonds, or even a few pretzels to make it sweet and savory. If you have a nut allergy, use sunflower seed butter in place of peanut butter. To cut down on the sugar, I’ve made it with Lakanto powdered sugar with great success. If you love giving homemade gifts, this is perfect. 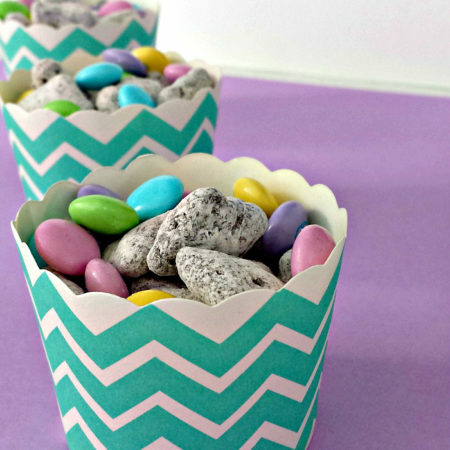 Just fill a mason jar or clear party bags, and tie a pastel ribbon around the lid. Give to friends, teachers, and coworkers for a thoughtful little Easter gift. I had to stop myself from munching so I had enough for my pictures! This colorful Muddy Buddies Snack Mix is a festive (and delicious) snack to have on your Easter table! Measure the cereal into a large bowl and set aside. In a microwave-safe medium bowl, microwave the chocolate chips, peanut butter, and butter for 1 minute, then stir. Continue microwaving in 30-second intervals, stirring in between. Transfer the mixture to a 2-gallon Ziploc bag and add the confectioner’s sugar. Seal the bag and shake until all the cereal is coated.